In a previous post, I began to explore and share my understanding of what Iain McGilchrist has written about and means by ‘betweenness’ as a way of being in the world. I thought that maybe a ‘both/and’ view of the world, rather than ‘either/or’ might explain it, but this explanation feels over-simplistic and unsatisfactory. It seems to miss the depth that McGilchrist is exploring. Whilst more ‘both/and’ thinking might serve, at least in part, to counter ‘either/or’ thinking, it wouldn’t get to the heart of the problem. Martina Emke wrote ‘Betweenness’ is related to the concepts of ‘rhizome’ and ‘becoming’ (Deleuze & Guattari, 1987). ‘Betweenness’ is a counter-narrative to the idea of identity, a constant process of transitioning that pertains to humans and non-humans. But McGilchrist’s idea of ‘betweenness’ as a way of being in the world, goes, I think, beyond all these three quests at seeking understanding of how we learn to understand and live with the uncertainty, ambiguities and complexities of the world we live in. It even goes beyond language. ‘Any one thing can be understood only in terms of another thing, and ultimately that must come down to a something that is experienced, outside the system of signs (i.e. by the body). The very words which form the building blocks of explicit thought are themselves all originally metaphors, grounded in the human body and its experience.’ (p. 118. The Master and his Emissary: The Divided Brain and the Making of the Western World). I suspect that any attempt to fully articulate and define what ‘betweenness’ might mean is going to fail, if only because, if it is embedded in experience, then it will necessarily be personal to each and every one of us. The nearest anyone I know has come to presenting a holistic view of ‘betweenness’ as expressed by McGilchrist is Matthias Melcher with this map, which he sent me in a personal communication and has given me permission to share in this blog post. (Clicking on the image will enlarge it). This view of ‘betweenness’, a view resonant of the right hemisphere’s holistic approach (the view that McGilchrist has suggested is being lost in favour of the left hemipshere’s fragmented abstracted view of our world, in which we see things as parts rather than a whole), has been arrived at by reading through The Master and his Emissary’ to find everything that McGcilchrist has said about ‘betweenness’. There is no one section or chapter addressing this point. (It would be rather ironic if there were.) ‘Betweenness’ is a theme that runs through the book. Having collected all the ‘parts’, Matthias, using his Think Tool, has been able to look for relationships between the parts and create this ‘whole’. Someone else, of course, would have created a different set of connections, a different whole, but there would probably be enough similarity to come to some common understanding. Is there then, some value to thinking not in terms of either/or, nor even in terms of ‘both/and’, but in terms of maps of relations? Would this be a better way to understand ‘betweenness’? It may be that on viewing the map that you can see different or additional connections that you would like to make. 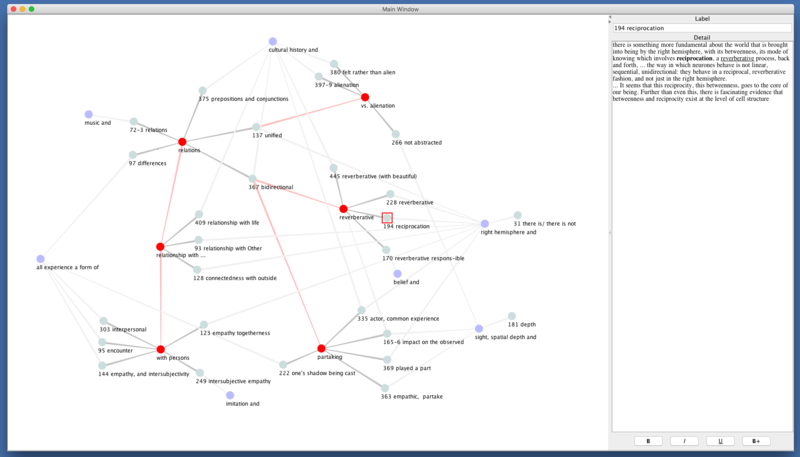 If you would like to edit the map you can download Matthias Melcher’s Think Tool from his website – http://condensr.de/ and then upload his file, which is accessible via this link http://x28hd.de/tool/samples/betweenness.xml by dragging and dropping it into the tool. 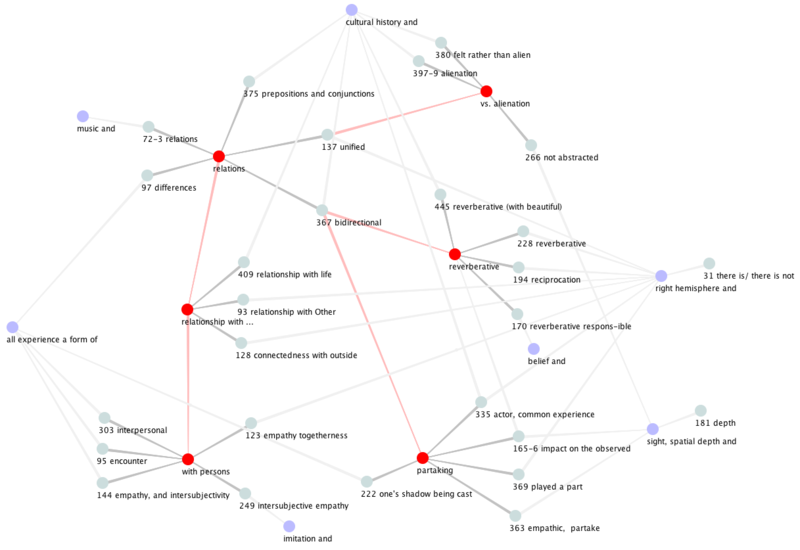 Many thanks to Matthias Melcher for creating this map which helped me better understand ‘betweenness’ and for sharing his open website and the file links. Interesting way(s) to approach and experiment with ‘betweenness’! Just one heretic question: Why does there need to be a ‘whole’? Isn’t betweenness about the power of connections and what these connections (for me assemblages) can achieve? A quick response for now. I suspect this is my error and poor/sloppy use of language. Would ‘big picture’ or equivalent be better than ‘whole’? It’s more than just the connections, I think – but I will need to get back to you on this 🙂 Thank you. I think the notion of a whole assumes greater importance as soon as you start thinking about the purpose of mapping inbetweenness (a great idea by the way to understand connections). Answering the question ‘why are we doing this?’ reveals the purpose or purposes and the ‘wholeness’ of the connections between the parts. If you are mapping the inbetweeness between the parts of a bicycle for example, the purpose of which might be to get from A to B quickly and safely, the ‘whole’ would have to include those parts contributing to speed and safety. Hi Martina and John. Thanks for your comments. Having checked through McGilchrist’s book, I see that he repeatedly discusses the relationship between the whole and the parts. We have to remember of course, that he is coming at this from the perspective of the differences between the right and left hemisphere’s of the brain – particularly their different views of the world and where and how they focus their attention.